...To overcome these challenges, PCPGM’s Enterprise Research Infrastructure and Services (ERIS) worked with HP to conduct a series of throughput and scaling tests that identified a pay-as-you-grow storage system as the ideal setup to successfully handle the exponentially increasing volumes of research data these academic medical centers were working with—and doing so without compromising performance. 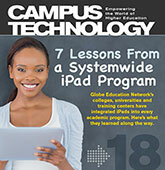 You must be logged into your Campus Technology account to download this white paper. If you are not logged in you may do so at the bottom of this page or the login button or the upper right of the page. If you do not have an account please sign up for free using the login panel.